These were recommended to me and I put them on my birthday list as they sounded really good. They were described as water resistant but I was quite surprised when them turned up and I felt the material. They feel a bit like a wet/dry swimming suit! Doesn’t change the quality or anything, just surprised me. I’ve never had breeches (or any clothes for that matter) made from something quite like that! After ordering them I was contacted by the company saying that they come up quite small and that I might want to order a size up. I’m usually a 30/32, so decided to order an 34. When they arrived they fit but were still a bit snug. If I was to order another pair I would probably go up to a 36 unless I lost some weight! I went for the navy, as I have plenty of black and cream. But do quite like the brown too. They also come in a huge range of sizes, so you shouldn’t have an issue trying to find a pair to fit, even if you need to go up a few sizes. So far I have worn them around the yard and schooled in them and they are comfortable. However, because they are 2 layers, I find them tricky to pull up properly. It might be because I could do with the size up, but I couldn’t get them to fit quite right as I could only pull up the outside layer to wear I wanted it, so it quickly fell back to where it was originally. Because of this, I don’t quite have the amount of movement I would like in the saddle. Saying that, I would have no problem hacking out for our in them and I did school perfectly fine the other day. But they weren’t the most comfortable thing in the world to ride in. To me this isn’t exactly a problem as I tend to get cold while doing yard jobs and hacking, so for the times I get the coldest they are perfect. If I was getting cold schooling I would probably just swap them for the next size up. Now, these were quite pricy compared to my usual cheap and cheerful Harry Hall and Loveson breeches… in fact I could probably buy 3 pairs for what I paid for these! But my cheaper brands never last long whereas my more expensive Mark Todds are going strong after several years! So I’m hoping these will go the same way. So now for the big question, do they work? The answer is simple, yes! 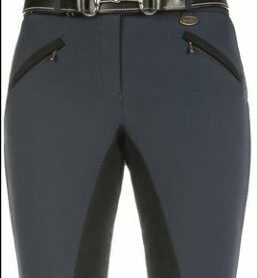 I think they kept me just as warm as the thermal under breeches I reviewed the other week and the water resistant properties make them better for long winter rides than several non water resistant layers. So for someone who rides in all weathers or wants something suitable for jumping on and off horses and doing yard jobs I think they would be fantastic!